In many rivers throughout the world, dams have greatly altered the aquatic ecosystem. These structures block migratory routes for anadromous species that live in saltwater and migrate into freshwater to spawn, preventing them from reaching their spawning habitats unless a fishway is installed. The extensive loss of spawning habitat due to impassable barriers has led to severe declines in anadromous fish populations. Many dams also create lake-like impoundments on the river. The impoundments have slow currents and accumulate sediments and organic matter. With the shift in habitat from lotic (rapidly flowing water) to lentic (still water), the populations of riverine fish species decrease as species that prefer slow moving water become more prevalent. There are about 22,000 known dams in the rivers along the east coast of the United States though there are likely thousands more that have not been inventoried. Many of these dams are considered obsolete and no longer serve a useful purpose. Others are reaching the end of their life expectancy and potentially face expensive upgrades in order to be relicensed. Because of these costs and the negative environmental impacts dams have on the ecosystem, dam removal efforts are becoming increasingly widespread. One of the largest projects in the United States is the Penobscot River Restoration Project in Maine. The Penobscot River is the second largest watershed in New England, draining about a quarter of the state of Maine. There were seven dams along the main stem of the river used for hydropower production or flow control. The two most downstream dams were removed: the Great Works Dam in 2012 (Figure 1) and the Veazie Dam in 2013. In 2014, a new fish lift was installed at Milford Dam, the new most downstream barrier, and in 2016, a stream-like bypass channel was constructed around the Howland Dam to improve fish passage. After the completion of the project, about 3,219 km (2,000 mi) of river and stream habitat was opened up to migratory species for the first time in over 200 years. Figure 1. Removal of the Great Works Dam in June 2012. Source: Wikimedia Commons. Figure 2. Field technicians netting fish at the bow of the electrofishing boat in the former Great Works impoundment. Photo by Jonathan Watson. 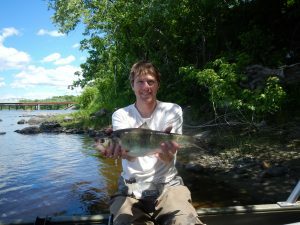 A team of researchers led by Jonathan Watson and Dr. Stephen Coghlan from the University of Maine investigated how the dam removals and fish passage improvements affected the fish assemblages (the abundance and variety of different species) in the river. 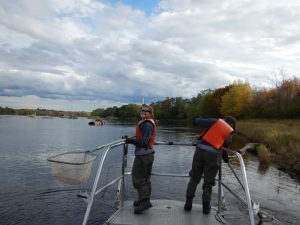 Between 2010 and 2012, Dr. Coghlan’s lab surveyed the fish assemblages of the main-stem of the Penobscot River and several of its major tributaries before the dam removals using an electrofishing boat. Electrofishing is a common survey technique used to sample fish populations in freshwater. As the name suggests, an electrical current is passed through the water to momentarily stun fish so they can be caught with a dip net (Figure 2). After the fish are identified, counted and measured, they are released back into the river unharmed. The scientists sampled fixed transects along the main-stem adjacent to dams as well as areas with suitable fish habitat. They also sampled randomly selected sites along the river. The fish assemblages were surveyed again between 2014 and 2016 after the dams were removed. They sampled the fixed transects from the previous survey adjacent to the existing dams and now former dam sites as well as sites selected randomly. The researchers found significant changes in the fish assemblages directly upstream of the former dam sites. 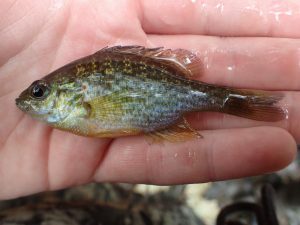 Lacustrine (lake dwelling) species that were common in the impoundments, such as pumpkinseed (Lepomis gibbosus; Figure 3) and golden shiners (Notemigonus crysoleucas), experienced large declines in abundance after the dams were removed. Smallmouth bass (Micropterus dolomieu), a non-native generalist species that can adapt to a variety of habitats, were still abundant in the river immediately after the dam removals. The numbers of young-of-the-year smallmouth bass (born within the past year and have not yet reached one year of age) in the former impoundment sites decreased because of the loss of suitable spawning habitat. Figure 3. Juvenile pumpkinseed. Photo by Steve Luell. 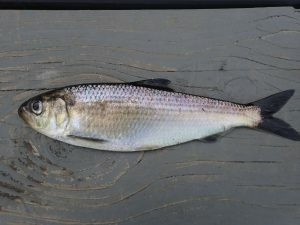 The distribution of anadromous species such as river herring, collectively alewives (Alosa pseudoharengus; Figure 4) and blueback herring (Alosa aestivalis), shifted upstream of the former dam sites. The number of young-of-the-year river herring increased downstream of the former dam sites indicating successful spawning. Another species of anadromous fish, American shad (Alosa sapidissima), were found to have begun to recolonize the river after the dam removals (Figure 5). Before the dams were removed, American eels (Anguilla rostrata), a catadromous species that lives most of its life in freshwater and spawns in the Sargasso Sea in the Atlantic Ocean, were abundant below the Veazie Dam as it blocked the upstream migration of juveniles coming from the ocean. After the dam was removed, their abundance below the site decreased as a result of the increased accessibility to upstream habitats. Figure 4. Alewife. Photo by Steve Luell. Figure 5. An American shad captured below the fish bypass channel at Howland Dam. Photo provided by Jonathan Watson. Now, the new most downstream barrier is the Milford Dam which still fragments the Penobscot River. While the fish assemblages downstream changed as a result of the dam removals, little change was observed upstream of the Milford Dam during the survey. As of November 2018, the Maine Department of Marine Resources and the Brookfield Renewable Energy Group counted over two million river herring, 3,923 American shad, 755 Atlantic salmon (Salmo salar), 762 striped bass (Morone saxatilis) and 1,976 sea lampreys (Petromyzon marinus) in the fish lift at Milford Dam since it opened in 2014. Future studies will be needed to determine if the improvements to fish passage at the Milford Dam alter the fish assemblages upstream. After the dams were removed, the fish assemblages changed rapidly as the habitat changed from lentic to lotic in the former impoundments. Aquatic connectivity has greatly improved for migratory species in the Penobscot River Watershed, opening up habitat that was not accessible to them for over 200 years. The results from this study show that dam removals are an effective way to quickly restore riverine fish assemblages. Watson, J.M., S.M. Coghlan Jr., J. Zydlewski, D.B. Hayes, and I.A. Kiraly. 2018. Dam removal and fish passage improvement influence fish assemblages in the Penobscot River, Maine. Transactions of the American Fisheries Society 147(3): 525-540. Next story Just because there’s no water doesn’t mean it’s not fish habitat! Temporary streams provide spawning habitat for river fishes.